Cabin 8 at White Iron Beach Resort is a unique rental property with a large, private lot and plenty of level parking space. This northern Minnesota vacation home is set back between the trees, offering a relaxing, dappled shade perfect for outdoor dining — and naps. Renovated in 2012, this traditional log cabin is equipped with modern conveniences such as wifi, a full bath, and a fully equipped kitchen with new appliances. 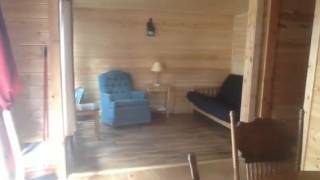 The interior of the cabin features two private bedrooms and an open, social living area with comfortable chairs. This non-smoking cabin for six on White Iron Lake in Ely, MN, also has a large, open-air deck on the lake-facing side, an outdoor concrete fire pit ring and a wooden picnic table. Pack up the family and head out to Cabin 8 for an unforgettable vacation full of open water and great views. Sleeping arrangements: The first bedroom at Cabin 8 is furnished with one full-sized bed and the second bedroom is furnished with two twin-sized beds. There is also a futon sofa in the sitting room. Cabin 8 is one of a collection of 26 scenic cabins clustered at the water’s edge at White Iron Beach Resort. The resort caters to small family vacations and couples’ getaways, in addition to larger events, such as corporate retreats, wedding parties and reunions. Make the most of Cabin 8’s remote location by exploring the Boundary Waters Canoe Area Wilderness via the entry point in nearby Ely, MN. We can help you get set up with permits through our partnership with the USDA Forest Service. Spending a week in the surf and sun at the edge of White Iron Lake is relaxing, rejuvenating and fun for resort guests of any age. It’s especially exciting for anyone who likes to cast a line into clear water and pull out a trophy-worthy walleye. The waters of White Iron are plentiful, routinely offering up walleye, bass, crappie and northern pike. Make the most of the location by taking advantage of onsite rentals for pontoons and motor boats — as well as complimentary canoes. Guests can explore the large recreation lake — which connects to a long an scenic chain of lakes — in canoes or kayaks, or swim, splash and wade from the sandy beach area at White Iron Beach Resort. Other resort amenities include boat docks, a children’s play area, a sauna, a game room, volleyball and basketball courts, and weekly marshmallow roasts around the fire. Venture out into the surrounding wilderness areas for hiking and biking along numerous beautiful and well-maintained nature trails. The area surrounding the tourist town of Ely, MN (home to unique local shops, entertainments and dining spots) is also home to the Superior National Forest, the International Wolf Center and the Tower-Soudan Underground Mine. Peak season at White Iron Beach runs from mid-June to mid-August, with weekly rates of $1,408.00. During the off-season, weekly rentals are available at a rate of $1,126.00.